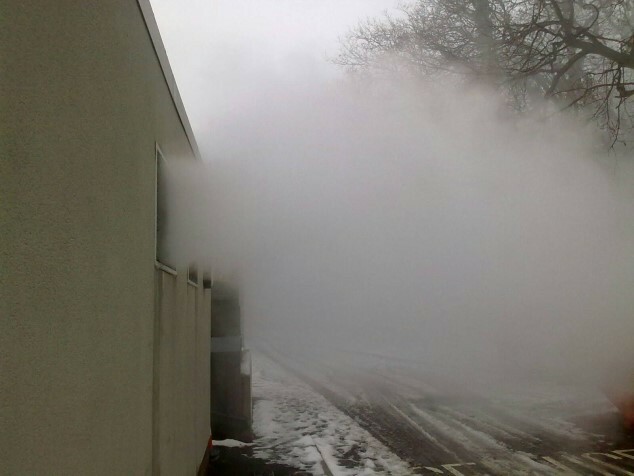 In 2018 a UK engineering company asked Veotec for help with an issue concerning its condensing boilers. These exhaust a plume of steam, which often contains small concentrations of acid vapours. It is common for the exhaust outlets of these boilers to be located at ground or low level especially when retrofitting or installing the boiler into a pre-existing installation. A common solution to the issue of exhaust plumage is to exhaust at high level. This is however not always possible or practical. Veotec’s moisture eliminator offers a solution. However, due to the presence of acid in the vapour and the potentially elevated air temperatures, the normal method was not suitable. A solution was found using completely stainless steel construction methods including the use of expanded stainless steel tubing in place of conventional plastic spacers or combing methods for retaining mist eliminator vanes. Due to the high velocities and the low pressure loss characteristics of the equipment, it is very easy to install the Veotec solution into existing duct work systems with minimal modification. Several of these systems have now been successfully installed on both new and existing boiler exhaust systems with great success in eliminating unsightly plumes and removing potentially harmful vapours.